Tied of Chasing Your iPad or iPhone Cable? I’d like to be able to take credit for this one but I was out showing homes the other day and noticed that the owner had kept their cables from falling behind the desk with a simple binder clip. 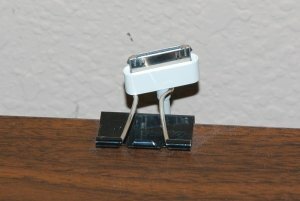 The clip is attached to the overhang on the desk and the cable is run through the wire handles. 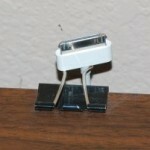 When the wire is removed from the iPad or iPhone it usually slides back to the clip making it easy to find and reconnect later.